August 15th, Independence day evokes a mixed response in the mindset of the pre-partition generation. With Freedom came Partition and loss of Homeland. But surely freedom did not connote freedom from Identity and Unity. 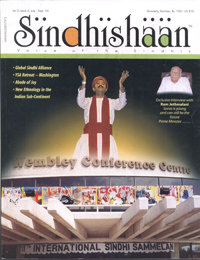 At the 11 th International Sindhi Sammelan held in London last month I was asked to identify two burning issues of relevance to Sindhis and Sindhiat that were of paramount concern to me and in my perception needed to be addressed with the highest priority. “Disintegration of the Sindhi Identity” and “Abysmal lack of Unity” was my spontaneous reply. We have been witnessing a lot of activity on diverse fronts towards the restoration and preservation of the Sindhi Identity like the spurt on the cultural front and various endeavours towards promoting the language. Unfortunately nothing is visible on the ‘Unity’ front. I have often wondered if our genetic code carries no imprint of the concept of unity. It is often said in jest about our fellow citizens from Bengal or Kerala – “You meet one – you discover a Poet; get two of them together and you find a Labour Union; get three together and you witness the start of a revolution”. But at least they stand by each other; contrary to what some say, equally in jest, about Sindhis; attributing to them characteristics similar to those found in the frogs held captive in an open jar. “None escaped; as the moment one tried to, the rest pulled it down” Die hard optimists amongst us might project this as our attempt at unity – “all together at the bottom of the jar”. But I am sure you understand exactly what I am trying to communicate. So many worldwide associations, organizations, panchayats etc. etc. but not ONE COMMON VOICE. Negligible few oblivious to the all-pervasive bitching and back-biting against one another although most of them dedicated to the objectives targeted by their institution and carrying on their tasks with a missionary zeal. And this is the greatest dichotomy. WHY IS THIS SO? ARE WE CURSED WITH A SELF DESTRUCTIVE AND OBSESSIVE EGO THAT DOES NOT ALLOW US TO SHARE A COMMON PLATFORM? At times I feel frustrated and lament in despair ‘To hell with it – how does it affect my family, my friends, my business and my life!’ But sooner than later I veer back to contemplating on this issue and working on possibilities of correcting this situation. WHILE THERE IS LIFE THERE IS HOPE. ANY SUGGESTIONS?